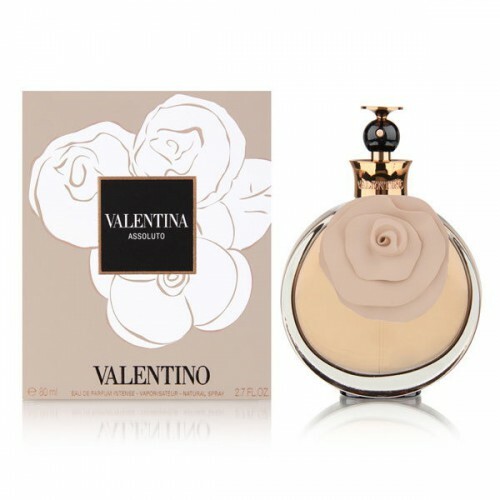 Valentino Valentina Assoluto is perfect for a romantic and sensitive woman. Valentino Valentina Assoluto 80ml. Eau De Parfum is very CHYPRE refined fragrance that is perfect for a romantic and sensitive woman. This extremely luxurious perfume you will first enchant with their sophisticated tones and then open your sensual side of the personality. With this fragrance you will feel extremely attractive throughout the day. Refreshing fragrance composition Valentino Valentina Assoluto opens bergamot notes, sweet juicy peach flavors and captivating sensual tubers. Mysterious composition intoxicating heart unveil its exciting tones using subtle essences of jasmine and tuberose blooming. Delicately sweet vanilla combines with the warm scent of the foundation, which offers a unique chord of cedar, moss and pure exotic patchouli. Exceptional women's fragrance Valentina Assoluto Valentino from exclusive brands perfectly complement all modern women who know what they want, but conceal a fragile romantic soul. This exclusive cocktail of sensuality and gourmet tone looks very cuddly, while untouched. Valentina Assoluto fragrance bottle is decorated beautifully illuminates flower. Perfume Valentina Assoluto are great for day wear and will be a great addition in every situation. It's delicious Italian aroma that fills the atmosphere a touch of romance. Its unique smoke is full of passion and sensuality, impulsiveness and tenderness, it intrigues and captivates, fascinates and enchants. The passages of this delightful perfume can feel the magic of the Italian night, it awakens the deepest feelings and filled the air with a sense of love. Floral and fruity fragrance composition has such a harmonious sound, it would be appropriate to supplement any image of a charming lady. Fascinating masterpiece Valentina Valentina Assoluto offers luxury truffle and sweet peach, complete with refreshing accents of bergamot. Central fragrance notes radiate passion. Italian heady jasmine and sweet tuberose dissolved here caressing haze Madagascar vanilla. Durability and refinement incredible compositions provide passages completion of perfume, in which softness oakmoss patchouli supplemented freshness and elegance white cedar.